Scroll down to see compatible models. Please, make sure your MacbookPro supports 8GB DDR3 1333MHz speed ram into one slot. Finding compatibility: On your Mac screen find and click Apple icon located in left hand side upper corner and chose " About this Mac ". Click " More info ". In the Contents section on the left side of the screen, click " Memory " See memory type and memory speed- MAKE SURE, YOURS IS DDR3, 1333MHz. 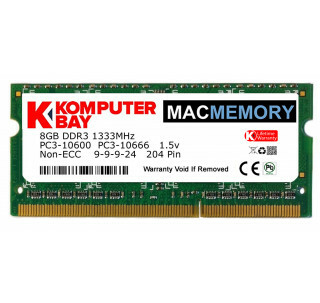 Your Mac must support 8GB ram into one slot.